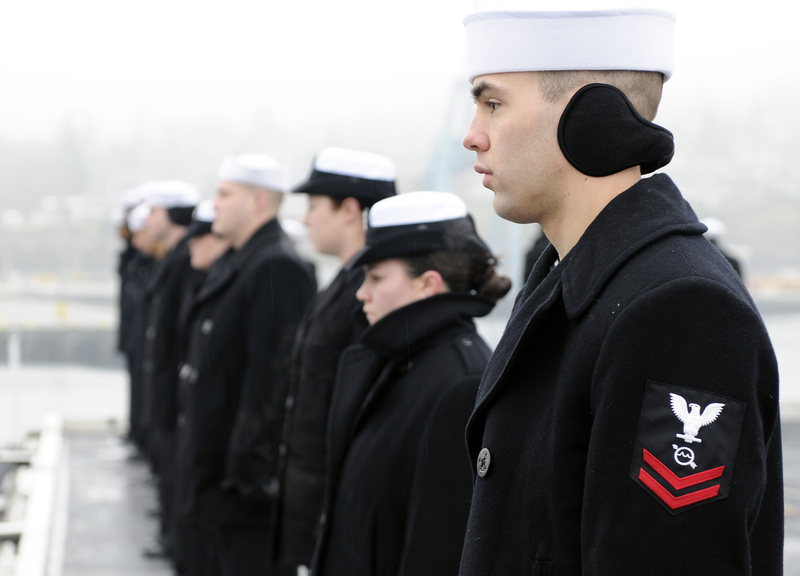 In their annual career survey, an online job bank ranked one of the nation’s toughest, proudest and most critical occupations as the third-worst job to have: sailor. The survey, aimed at those considering different careers, arrived at these results by ranking each occupation across five categories, which seemed to be a mix of government statistics and subjective values. Behind the rating for enlisted troops was relatively low income (on average $36,000), high stress and physical demands, and lowered hiring prospects — likely referring to the coming drawdown, which centers on the Army and Marine Corps. The list offers some curious comparisons. Attorney and vending machine repairman are ranked side by side as the 88th- and 89th-best jobs, respectively. Admiral (well, “Military General”) ranked 141st, besting garbage collector, but not bus driver (130th) or dental laboratory technician (135th). And plumber (75th) left all these in the dust. So what do you think? Did they get it wrong? I agree! We are over worked, under paid, and the governement is cutting our numbers which means more work with fewer people. Lets not forget the fact that more ships are being decommed then commisioned meaning longer underways. You can not forget about the fact that they have way to many admrials and not enough enlisted to do all the work. if you want to cut people cut the admrials in half and then you can add five times that many enlisted billets back to the ranks. There are more admrisl than ships in the Navy. If they keep running the military like it is a business then you will not have a military because every one is going to start getting out. If the economy ever picks up again then more will start getting out faster than they can put them in to the military. If they want to save money then start closing more bases over seas and just pull military bases olut of some countries all together and let them defend for them selves being they do not want to pay for there own military. If we did that then we would not have to cut manning because they would be on bases in the states and fewer over seas saving money. I DISAGREE!! I spent 10 years in the Navy on Active Duty, ENLISTED. I joined December 1999, after being out of high school for 2 years. Yes, when I joined I felt I was underpaid. I spent the better part of the next 6 years feeling like I was underpaid and overworked. What I realized when I returned home to visit friends and family in Kentucky was that I was in fact BLESSED! I made enough money to live comfortably, even as an single parent E6. My friends back home who had went to college for 4 years, gotten a bachelors degree, were still working dead-end jobs in Kentucky, barely making enough to survive- not even close to living as comfortable as I was. Most of them didn’t have insurance, rented small apartments, and drove cars that were probably unsafe. I wasn’t “rolling” in the money, but I made enough to support me and my son, I OWNED my own home in South Carolina, and drove a brand new car, and I had some of the best insurance in the country as well. Being enlisted in the Navy isn’t glamorous by any means, but it isn’t any where near the worst jobs in the country. You learn a trade, you learn a way of life, and above all, it’s a chance for you to start out in life with HELP, something other jobs don’t give you. Go to college, get a degree, and see if someone is standing there to help you get started in life. Some colleges will, but for most of us, we can’t go to those colleges. In the Navy, I had people who were interested in helping me succeed, helping me with my career, and they were there when I needed support. The ten years I spent enlisted were invaluable to me getting to where I am now. Where am I now? I own 3 homes across the United States, I own 2 very nice vehicles, and I am working as a contractor getting paid a very nice salary to do what I enjoy. I couldn’t have done any of this without the enlisted job I served in the Navy. I think being enlisted in the Navy is worth more than just the paycheck you see on the 1st and 15th, it was the foundation to my success. I admit being an enlisted person in the Military is the hardest job a young person will ever do. They are asked to do a lot with little resources. They do work long hours and put their lives in harm’s way every day. They are away from loved ones for months at a time. The base salary is not much. But this article does not mention the Housing allowance, subsistence allowance, FREE medical for the member and their family, 30 days leave per year and low cost dental insurance. A single E-5 stationed in Norfolk, VA with 6 years is paid $47,010 per year. That’s not to include a potential bonus and special pay/allowances while deployed, FREE medical, and 100% of college tuition paid. Most importantly they are doing something worthwhile. They can look in the mirror and be proud for providing the blanket of peace so fellow Americans can lay their heads on their pillows. I challenge anyone that will pay an individual with only a high school diploma that much. Ask those separating (ERB, etc.) if now they think they are overpaid. As a counselor, I find the vast vast majority of separating sailors now job hunting are shocked to find out how much the average sailor makes compared to what their civilian counterpart makes. In almost all cases, the enlisted sailor makes more than the average job seeker with a 4 year degree (officer equivalent). Those civilians making “good” money for the most part also work much more independently (and harder) than an enlisted sailor. I agree with the article, as a sailor that is being told to get out because of an overmanned job, however the command is now left with 3 people to do the job of 6. There is no promise that you are going to have a job next year. These people in DC have no idea the choices they are making and how bad they are making it, they make higher demands of a smaller force and don’t understand why things are failing. And dont assume that I am a bad egg, I have 13yrs of faithful service, but because I just could not score overly well on a test…I could never get past E5. I will never advise someone to join today, and I will tell them how overworked they are, yes we get a lot “extra” things, but what does it matter when you are working 14hrs a day? Come on be honest, being in the military in general is not what it is cracked up to be….and it will soon show…. Those of you that disagree remember the navy in its heyday – or you’ve never worked in a rating that requires you to be up for days at a time. The most I’ve gone in one stretch is 72 hours, and my body just can’t do that anymore. I’ve been in for 16, and I was just told by a senior chief there are 24 hours in a day, so there’s plenty of time to get more work done even though we are undermanned and our division is outsourced to other departments and areas of the ship. It’s not the same navy as it was, and it continues to go downhill. I’ve seen both sides; I at one time loved my job. No longer. I hate what this organization has come to believe in and how it treats its loyal workers.